Dura Hedge Stats offers the most privacy of all chain link privacy lattice products. It will easily install on most mesh sizes without tools or locking pieces and create a beautiful hedge like effect, on any chain link fence, old or new. Dura Hedge privacy slats will provide privacy for your home with years of maintenance free beauty. The PVC Slats used to make Hedge Slat is U. V. stabilized to protect it from the the sun's harmful rays. Extended research on these privacy slats has been conducted to ensure its durability in extended outdoor use. Durable, long lasting construction of flame retardant 4 ply, 6 mil U. V. stabilized PVC for increased privacy and real hedge like density with a center core of stiff twisted 16 gauge galvanized wire for ease of installation, just push down from top. Dura Hedge carries a full 10 year warranty against breakage under normal use. Our privacy hedge slats are not your regular hedge slats. Out hedge slats have more than one color PVC in order to maintain a realistic look. 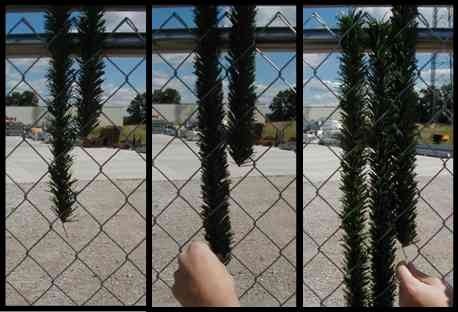 Be careful when comparing our product to others, the Dura Hedge slat is a superior looking product.